A great look for special occasions, these polished 14K yellow gold small heart in cross stud earrings combine faith and love in one to make a beautiful pair of earrings. The crosses, which have arms that gradually increase in size as you move outward from the center, have a small heart right in the middle of each. Measuring 10mm by 6mm in size, these earrings from Apples of Gold Jewelry have a highly polished yellow gold finish and a secure push back closure that will keep them in place. 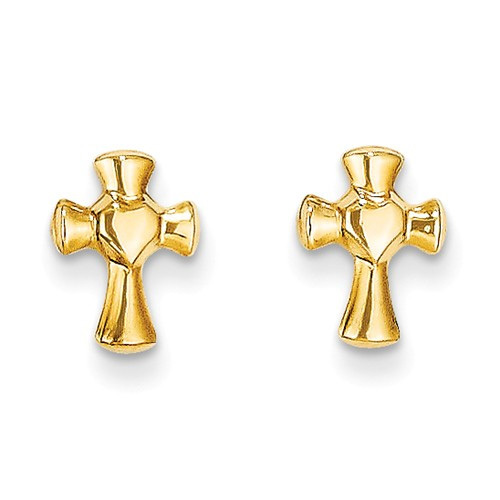 We guarantee our Small Cross in Heart Earrings, 14K Gold to be high quality, authentic jewelry, as described above.